Today I have for you the next part of my Pinup Fit series. A couple weeks ago I shared my Morning Stretch Routine and thought it would be fabulous to follow this up with a bedtime stretch sequence to relax you and feel ready for sleep. If you would love more fit videos do let me know! Be sure to subscribe for more vintage fun, I release new videos every Tuesday, Thursday and Saturday. 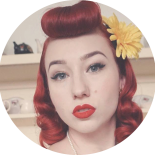 This entry was posted on September 8, 2018 by Miss Lady Lace in pinup fit, Videos, YouTube and tagged 1940's, 1950's, glamour, miss lady lace, perth, perth pinup, perth pinup blog, pin up, pinup, pinup blog, pinup blogger, pinup fashion, pinup fit series, pinup girl, pinup life, pinup lifestyle, red lips, retro, retro blog, vintage, vintage blog, vintage blogger, vintage glamour, vintage perth, vintage pinup blog.